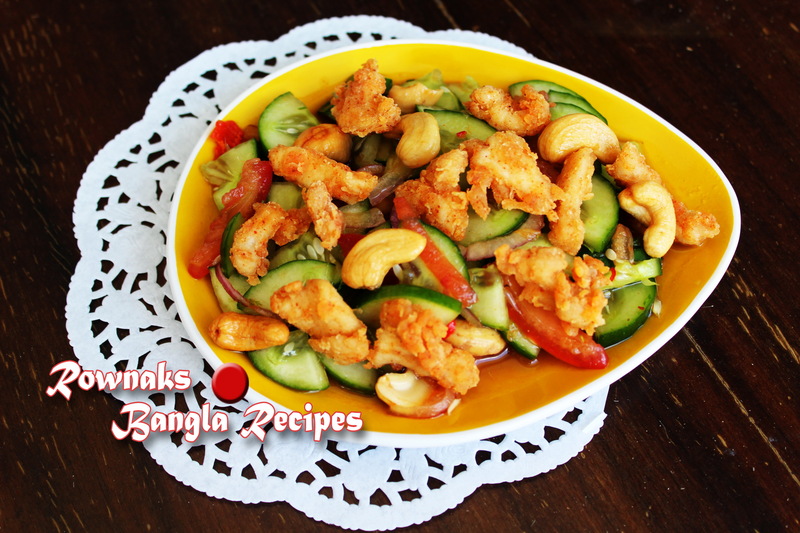 For Thai Chicken Cashew Nut Salad you can just stir fry chicken or grill the chicken and chop it up, but flour coated fried chicken gives a yummy crunch in your salad. I like it, hope you will like too. And like the spicy kick in my Chicken Cashew Nut Salad, so I use whole thai chillies but if you want less hot, you can deseeded it. And last not the least dressing depends on your taste buds, so you can use more or less ingredient to suit your bud. Marinate chicken and soya sauce together and keep aside for 10-15 minutes. Dressing: Combine all ingredients and keep it aside. Mix flour and chilli powder together. Rub flour mix on chicken pieces. Heat oil in wok pan and fry chicken pieces till it becomes crisp and golden brown. Fry chicken in batches, don’t over crowd the pan. Combine salad with dressing while still warm and toss fried chicken and toasted cashew nuts. Serve immediate yummy Thai Chicken Cashew Nut Salad.